Together with Bart Visman I made an arrangement of the opera Mirandolina by Bohuslav Martinů. 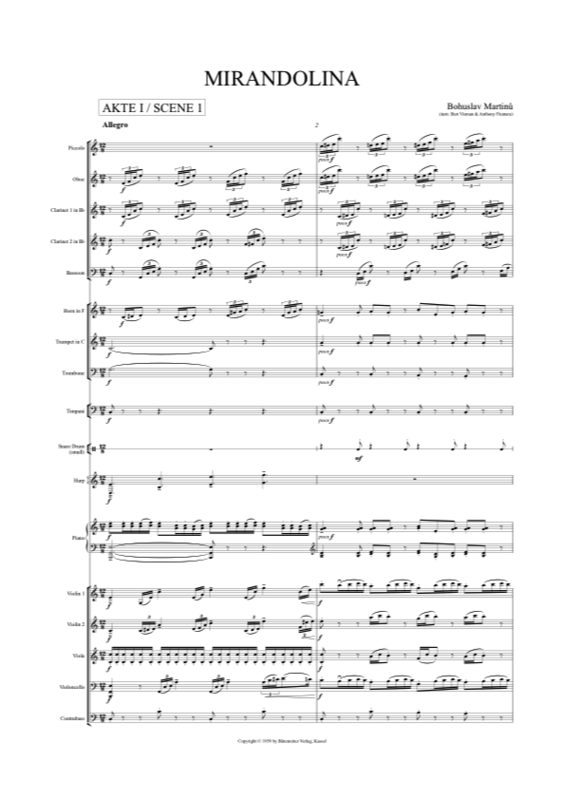 We translated the original orchestration for large orchestra to a version for large ensemble. Mirandolina (1953-4) is a comic opera in three acts, with an Italian libretto by the composer – after Carlo Goldoni's comedy The Mistress of the Inn (1751). In its essence, Mirandolina is really at home in the realm of chamber music, its character being close to that of the early opera intermezzo which was meant to ease up somewhat the solemnity and pomp of serious opera. This is brilliantly exemplified here by the presence of a saltarello, a much loved Italian dance in lively 6/8 metre. For his part, Martinů placed his own dazzling saltarello stylization before Act Three, where it has found its way onto the concert platforms as an orchestral piece existing on its own. December 23, 2010, by Nieuw Ensemble and Ed Spanjaard, in Schouwburg Haarlem. Available for rent/purchase from Bärenreiter • Alkor.